Christian Gambin, a stunning magician. Christian Gambin, award winning magician, World FISM and French Magic Champion, plays for the first time in London West End. Expert in close-up magic and a stunning magician. The nearer you are, the less you can see! 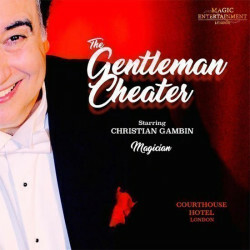 Use the search box at the top left of this page to search for The Gentleman Cheater Magic Show tickets availability.